Ducati has delivered the first Ducati Panigale V4 Speciale in India. The lucky customer is Kartikey Uniyal, who paid INR 51.81 lakh (ex-showroom India) for the limited-run motorcycle. 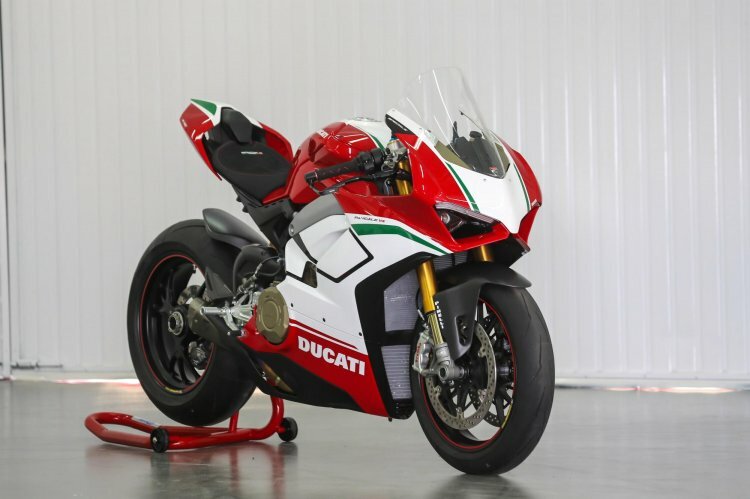 The Ducati Panigale V4 Speciale costs INR 51.81 lakh (ex-showroom India). The Ducati Panigale V4 Speciale completes the Panigale V4 range. The motorcycle features an exclusive red, white and green livery, and a titanium Ducati performance exhaust by Akrapovic. The bike features various unique elements like a billet steering plate along with a screen-printed logo and a serial number, an Alcantara seat with Ultrasuede and a carbon heel guard. The Ducati Panigale V4 Speciale sources power from a 1,103cc, 90-degree V4 motor that pumps out 226 hp of maximum power at 13,750 rpm and a peak torque of 133.6 Nm at 11,000 rpm. A six-speed gearbox transfers control to the wheel, while a slipper clutch and a bi-directional quick-shifter are standard. The motorcycle uses a lightweight lithium-ion battery and a cast magnesium subframe to attain a dry weight of 174 kg. The Ducati Panigale V4 Speciale comes equipped with fully adjustable Ohlins electronic suspension at both the ends, with the NIX-30 USD front forks and the TTX36 mono-shock at the rear. The Panigale V4 Speciale is also available with forged Marchesini magnesium racing wheels as an option. The bike is available for sale across Ducati dealerships in India in Delhi NCR, Ahmedabad, Mumbai, Pune, Kolkata, Bengaluru, Kochi and Chennai. In related news, Ducati recently revealed the Panigale V4 R and the Panigale V4 S Corse ahead of the EICMA 2018 at the World Ducati Premiere.